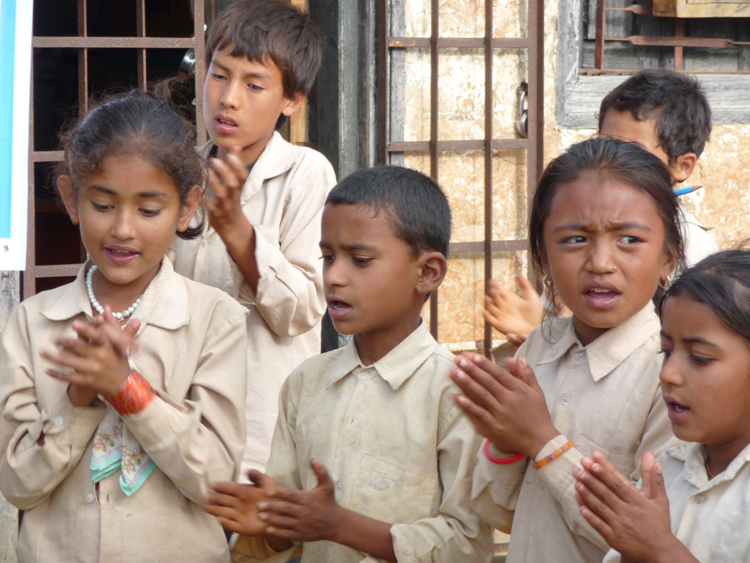 Pax Earth’s support in the education of poor and underprivileged students has been continuing in Kavrepalanchok district of Nepal for last two and half years. On Monday October 1, 2012, a 12-member’s Pax Earth team visited Shree Raktakali Primary School and Shree Kalika Primary School of Kavrepalanchok and distributed educational, sports and hygienic materials to the students amid a separate distribution program organised in these two schools. This time, the Pax team was accompanied by five friends from Britain: Timothy Axe, Christopher Axe, Sue Ecobs, Guy Hodgman and Dawn Hodgman. At 7:30am, Pax Earth members and British friends gathered at the PEN Secretariat, Pashupati, Kathmandu. 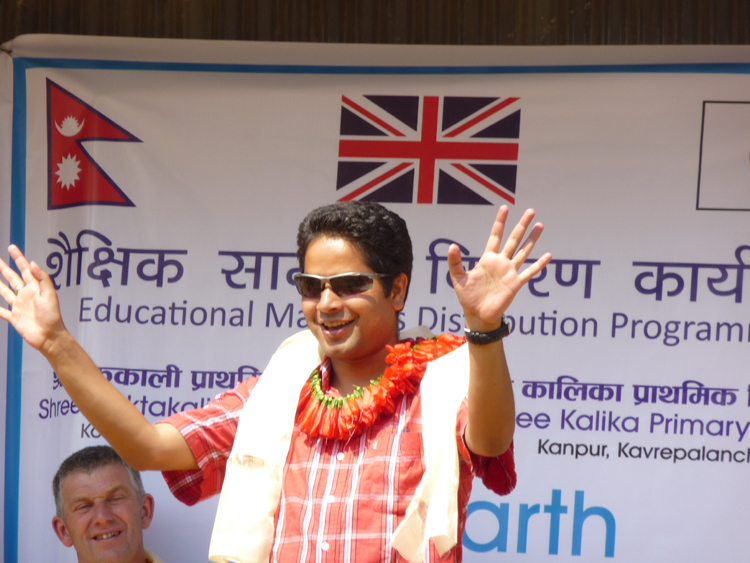 After having a cup of tea, a 12-member’s Pax team under the leadership of Pax Earth Nepal President Sujan Koirala accompanied by Secretary Binod P. Mainali, Treasurer Bal Gopal Shrestha, Joint Secretary Guna Raj Pyakurel, General Members: Debraj Ghimire, Sachin Koirala, Anita Subedi, and five British friends headed for education mission sites located in Kanpur VDC of Kavrepalanchok approximately 65Km east of Kathmandu. The Pax team stopped for the lunch at Dhulikhel Guest House, Dhulikhel at 9:45am. The team arrived at Shree Kalika Primary School at 12:15pm. Upon arrival, PEN President, members and British friends were warmly welcomed by Principal Ram Lal Shrestha, teachers and the students. The school representatives honoured Pax members and British friends with khadda and garlands. Without any delay, the program entered into the formal distribution ceremony. In a welcoming address, Sujata Mainali, a newly appointed teacher, warmly welcomed Pax Earth members and guests from Britain in this distribution program respectively. Similarly she welcomed teachers, parents and students. She said, “The supports extended by Pax Earth have contributed significantly in the education of poor and deprived students of this school.” She added, “The students are performing very well after Pax Earth’s noble initiatives.” She further wished for the successful holding of the day’s distribution. In a short speech, Dawn Hodgman expressed her happiness to come here and attend the distribution program. She praised Pax Earth for the support extended to the poor and deprived students of this school. She also shed lights on the importance of education and wished the students a very bright future. After her speech, she told a story of “Gingerbread man” to the students. The story was translated into Nepali by President Sujan Koirala. Then, Pax team in coordination with the teachers involved in the distribution. The students received notebooks, pencils, erasers and sharpeners. These stationeries are adequate for next three and half months. Pax team handed a spiral notebook and few ball point pens to the teachers. Similarly, the Pax team handed a football, a volleyball, few story books, few first aid accessories brought by British friends to the Principal Ram Lal Shrestha. The students also enjoyed chocolates and toffees brought from Britain. All five British friends thoroughly involved and enjoyed the distribution. In a special address, President Sujan Koirala, said, “It’s a matter of pride for us to support the poor and deprived children of this school.” Expressing his happiness over proper utilization of the given materials, he added, “As we have seen the students are properly utilizing the given materials, we are encouraged to do more for the students and the schools in the days ahead.” In his speech, he also thanked British friends for joining Pax team in the visit and moreover for bringing educational, sports and hygienic materials for the poor and deprived children of Nepal. At the end of the formal ceremony, Principal Ram Lal Shrestha extended vote of thanks to Pax Earth and delegates from Britain. He thanked Pax Earth for continuing extending support to the students of this school and expected the support will continue in the days ahead in a larger extent. After his speech, Principal Ram Lal Shrestha formally adjourned the ceremony. Master of Ceremony Teacher Ful Maya Lama smoothly coordinated the formal distribution program. After the distribution, the Pax team involved the students in few games. Guy Hodgman and Dawn Hodgman taught them few games to be played with a ball. 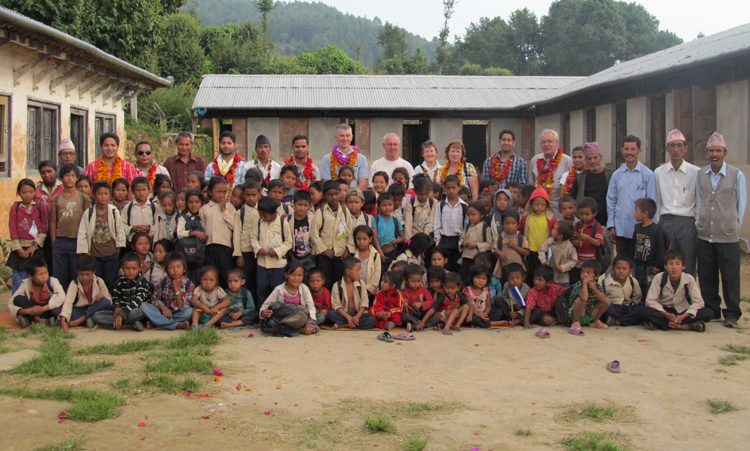 The Pax team had a group photo with the students and the teachers before the departure. At 2:00pm, the team headed for Shree Raktakali Primary School after receiving farewell from them. After half an hour, the team arrived at Shree Raktakali Primary School. 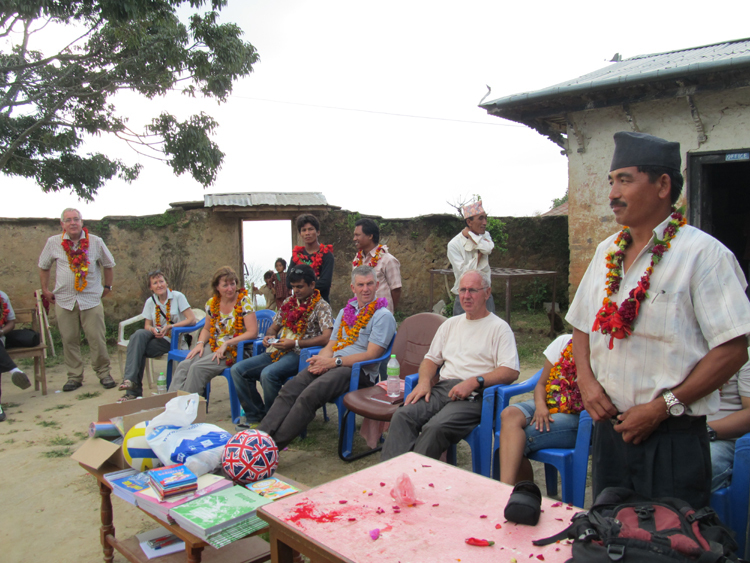 Upon arrival, Principal Hira Kaji Tamang cordially welcomed all the members at the main gate of the school. The Pax team and the school authority set up the distribution layout together and without any delay involved in the formal distribution ceremony. 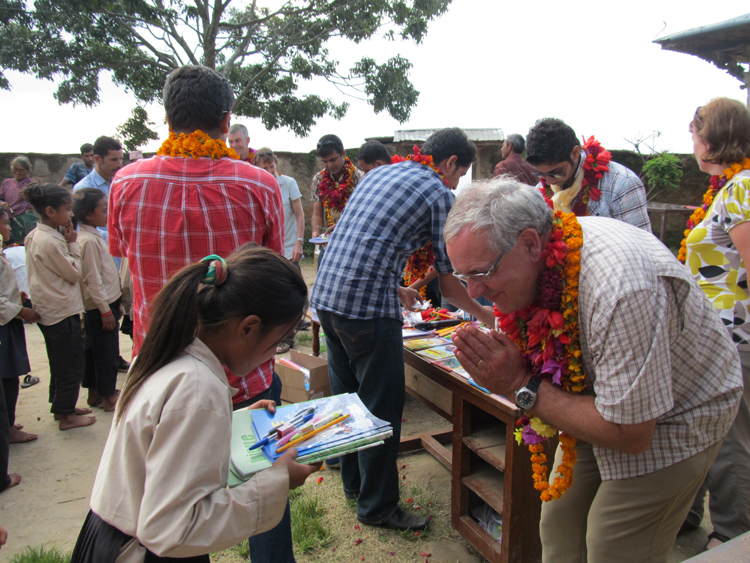 Like in Shree Kalika Primary School, Pax members and British friends were formally honoured with tika and garlands. Teacher Netra Prasad Pathak, in his welcome address, warmly welcomed Pax Earth members, special guests from Britain, school management committee members, parents, teachers and all ladies and gentlemen present on the occasion. He highly praised the Pax Earth support extended to poor and underprivileged students of the school. He wished for the success of the distribution program. In a short speech, guest Timothy Axe expressed his happiness to be a part of this distribution program. He told that his team has collected some educational, sports, hygienic and first aid materials and expected that these will be useful to the students and the school. He further hoped that the given materials will help in improving education and hygiene of the students. After his speech, the Pax team in coordination with the school authority involved in formal distribution. 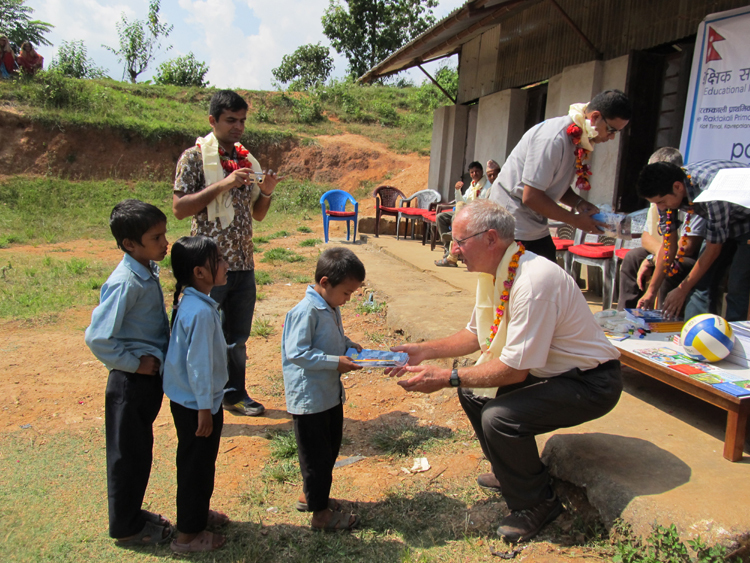 The students received notebooks, pencils, erasers, sharpeners and protectors. These stationeries are adequate for next three and half months. Pax team handed spiral notebooks and few ball point pens to the teachers. 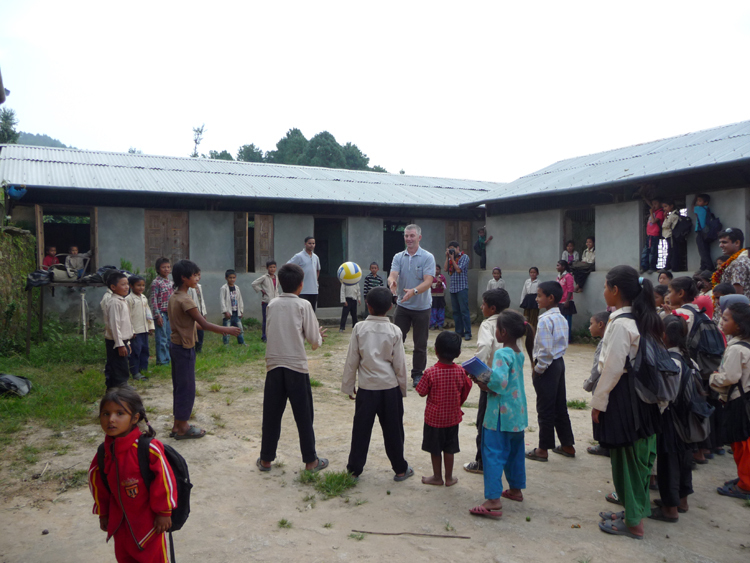 Similarly, the Pax team handed a football, a volleyball, few story books, few first aid accessories and some useful educational materials collected and brought by British friends to the Principal Hira Kaji Tamang. The students and the teachers also enjoyed chocolates and toffees brought from Britain. 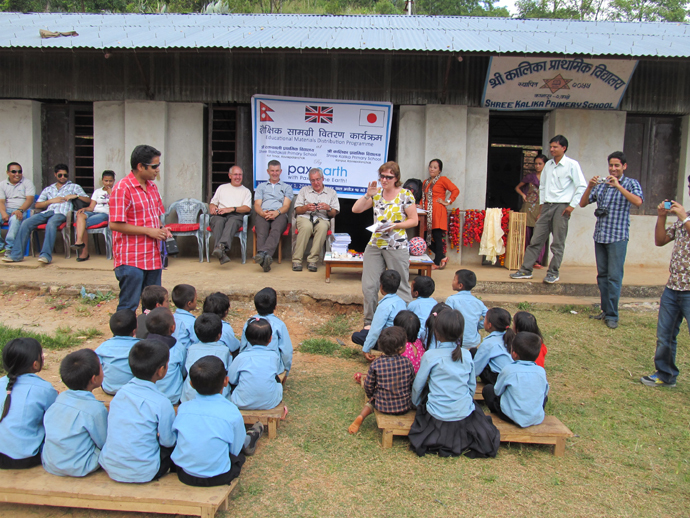 Like in Shree Kalika Primary School, all five British friends thoroughly involved in this distribution too. Chief Guest President Sujan Koirala, in his special address, expressed, “As per Pax Earth’s mission, we are involved in extending support in the education of poor and deprived children of this school. Only the educated people can shape the future of the nation so we want these children to be educated and help build this nation in future.” He sincerely thanked the school authority for the cooperation in implementing the organisation’s mission and expected similar cooperation in the days to come. He highly praised the way the school has protected the trees planted in August 2012. He thanked British friends for accepting our request to join in this trip and bringing some useful educational, sports, hygienic and first aid materials for the needy children from the Britain. At the end of the ceremony, former Ward chairman and the chairman of the distribution ceremony Buddhi Man Tamang extended vote of thanks. He thanked Pax Earth for contributing in education of poor and underprivileged children of this village for the past two and half years. He also admired special guests from Britain to come a long way to this school and extend support. He hoped that these supports will continue in the days to come as well. After his speech, the chairman formally adjourned the ceremony. Master of Ceremony teacher Hira Kaji Lama smoothly handled the formal ceremony. The students sang national anthem and performed few action songs for Pax team particularly for British friends during the formal ceremony. The students could learn few games from Pax team members led by Guy Hodgman. The British friends could also inspect the class rooms, school buildings and school area. The Pax team also inspected the tree plants planted in August 2012. The Pax team could have few group photos with the students, teachers and the community people before leaving from the school. The school offered teas and local snacks (beaten rice and curry) to the Pax team. At 5:15pm, the team departed for Kathmandu. The team could manage to visit Secretary Binod P. Mainali’s house on the way back to Kathmandu. The team stopped at Dhulikhel for the dinner. Accomplishing the mission of the day, the team arrived at Kathmandu at 8:45pm. Over 120 poor and deprived students and 10 teachers of these two schools benefited with this support. Pax Earth would like to heartily thank British friends Timothy Axe, Christopher Axe, Sue Ecobs, Guy Hodgman and Dawn Hodgman for bringing a good amount of educational materials such as pencils, erasers, sharpeners, pencil colours, calculators and chart-papers; sports materials such as footballs and volleyballs; hygienic materials such as toothpastes and toothbrushes, first aid accessories and manuals, and a large collection of worth-reading story books for the poor and disadvantaged children of remote Kavrepalanchok, Nepal. Pax Earth is also thankful to Kokuyo Stationery for sponsoring about 500 ball point pens for these kids. These ball point pens were brought here by Secretary Binod P. Mainali and Member Sudan P. Bhandari. Pax Earth is grateful to the principals, teachers and students of both the schools for their praiseworthy arrangements. Many thanks to the driver Harindra Shrestha. Last but not the least, all seven Pax Earth members (PEN President Sujan Koirala, Secretary Binod P. Mainali, Treasurer Bal Gopal Shrestha, Joint Secretary Guna Raj Pyakurel, Members: Debraj Ghimire, Sachin Koirala and Anita Subedi) deserve a special appreciation for successfully carrying out the mission of the day.